The Carriage Museum of America was incorporated in 1978 as a non-profit educational institution. 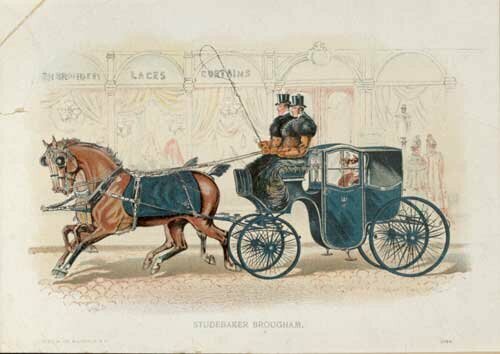 Today, we function primarily as a research library dedicated to preserving the history of the carriage era. It is our mission to serve as an authoritative resource for information, education and research about animal-drawn vehicles and related subjects. We strive to be a source of knowledge for anyone interested in learning more about carriages or the carriage trade. Now located at the Kentucky Horse Park in Lexington, Kentucky, the CMA library maintains a collection of approximately 1,200 books and trade catalogs, in addition to a large collection of prints, photographs, carriage blueprints, trade journals, and other resources. The library is non-circulating, but visitors are welcome. We share office space with our sister organization, The Carriage Association of America. The Carriage Museum of America also maintains a carriage collection of rare and unusual vehicles. The vehicles are preserved and maintained in original condition for research purposes. There are no carriages on display in our current location. In order to make the information in our collection more accessible to the interested public, we plan to digitize many of our resources and make them available on this website. Please continue to check back frequently, as more information will be continually added. When and where can I visit your carriage collection? The Carriage Museum of America does not currently have vehicles on display for the public. You are welcome to visit our research library, located at the Kentucky Horse Park in Lexington, KY. The library holds a large collection of books, prints, photographs, and other archival materials. The library is open by appointment on weekdays. Please call or e-mail to schedule an appointment. There are no carriages on display. There is no way of knowing what company manufactured a vehicle if it does not have a makers mark. There were over 7,000 carriage and wagon makers doing business by the early 1900s. Because many companies bought parts from specialized makers, they often produced very similar vehicles. Please search your vehicle for a name tag, name on the oil cap, paper label under the seat cushion, or name of the carriage manufacturer stamped on the axle spindle. How can I learn more about the company that made my vehicle? If you know the town where your vehicle was made, we suggest contacting the local libraries and historical societies in that area. You can search for these organizations online, or use the library and museum directory at your local public library. These local organizations may have business directories or records with more information. The Carriage Museum of America maintains a clipping file for some of these manufacturers. If you would like copies, please contact us. We can also help you with your research, although a fee may apply. For the serious researcher: Once you have established the dates when the company was in business, you can search through the local newspapers of the area for that time period. There were two leading trade journals of the time, The Carriage Monthly and The Hub, which can be a great resource. The Library of Congress makes microfilm of these journals available from about 1855 to 1915. To order the microfilm for a given year, contact the Library of Congress Photo Duplication Services department at 202-707-1771. We are not able to provide vehicle appraisals. The value of a vehicle varies greatly based on the condition of the vehicle and of the market. To have your vehicle appraised or to put it up for auction, contact Martin Auctioneers, at http://www.martinauctioneers.com/, or 717-354-6671. Do you have drawings that can be used to build a reproduction vehicle? The two major carriage trade journals published working drawings each year. Drawn to ¾ inch scale using the French or DuPont rule, these were considered to be the most useful for building a horse-drawn vehicle. Because of the large number of requests the CMA receives from people wanting to build full-size vehicles of models, we have compiled over 100 drawings into our book Working Drawings of Horse-Drawn Vehicles, available for sale on our website. Please contact us to learn if the specific type of vehicle you are interested in building is included in this publication. How should I restore my vehicle? As a museum, we recommend that vehicles in original condition should be conserved and left original. If you choose to restore your vehicle, it is important that the conservation be historically accurate. The best way to tell what your vehicle would have looked like is to consult catalogs and trade journals that show similar styles from the time period. Please contact us if you would like help with this project. Where can I learn more about driving? Contact the Carriage Association of America, our sister organization, at www.caaonline.com or 859-231-0971. The offer information about all facets of carriage driving, and also host events, tours, learning weekends, and an annual conference. John Stallard is the CMA’s Director of Operations. John manages the office in Lexington, Kentucky, and also serves as the reference librarian. He reports to the CMA’s Board of Trustees, who oversee the work and direction of the organization. A full listing of the members of the CMA’s Board is available here. John obtained a B. A. in Equestrian Studies from Lake Erie College, and has been a volunteer for the CMA and its sister organization the Carriage Association of America for a number of years. Many may know him from his role as Show Manager for the CAA Carriage Festival. John welcomes the opportunity to work with the CMA and to continue its mission to preserve the history of carriages and driving. The Carriage Museum of America is a 501(c)3 charitable organization. You can read more about our educational mission, and the steps we are taking to fulfill that mission, in our Bylaws and Annual Reports. 2014 Annual Report [pdf] – Learn more about the projects and progress of the Carriage Museum of America in 2014. 2013 Annual Report [pdf] – Last year’s annual report. Bylaws [pdf] – Want to learn more? Read the bylaws under which we were organized, and which continue to guide our work.